Washing your hands is a tireless task that we perform several times a day, every day. What if your hand-washing time could be made more enjoyable? These thirty-two examples of unusual and exciting soap dispensers add extra pizazz to your washing up time. Meet Hello Kitty in the bathroom, as your kids get cheeky in the bath. Go hands-free in your bathroom, with an automatic squirter below a minimal black and white holder. Drench your toothbrush holder, cake dish and dispenser in gold, with sparkling flakes covering their every curve. Live smarter every day, with our top thirty-two picks for a cleaner and happier bathroom and kitchen. 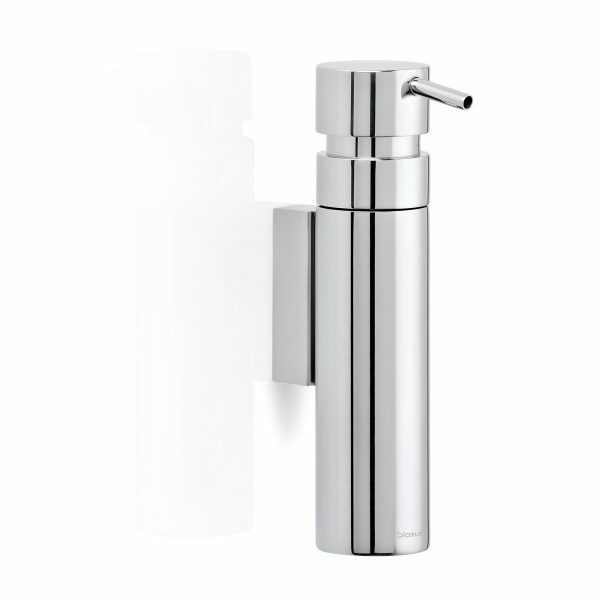 White Minimalist Liquid Soap Dispenser: Part of the Italian Birillo collection by Piero Lissoni, this white minimalist dispenser matches a range of interiors with its no-frills exterior. Vintage Floral Soap Dispenser: Tired of bathroom accessories that look thrown together? This four-piece design boasts a toothbrush holder, soap dish, dispenser and mouth-rinsing cup, for an elegant way to achieve fresh breath each morning. Floral Soap Dispenser: After just the single dispenser? This similarly-designed ceramic bottle and aluminium holder add a touch of the Florentine to your master bathroom or ensuite. 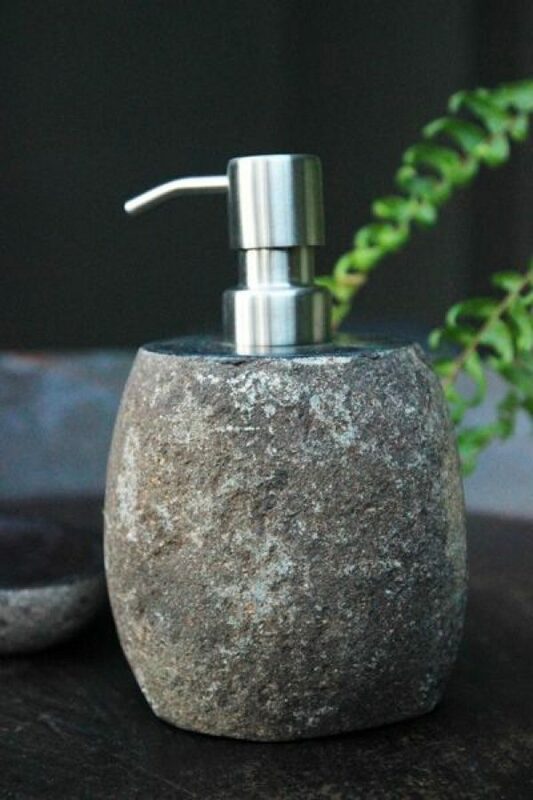 Stone Soap Dispenser: Ceramics and glass dominate bathroom dispenser sets – but what about some of our more traditional materials? Take a trip back in time with this natural stone dispenser, a perfect match for the bathroom or rustic kitchen. 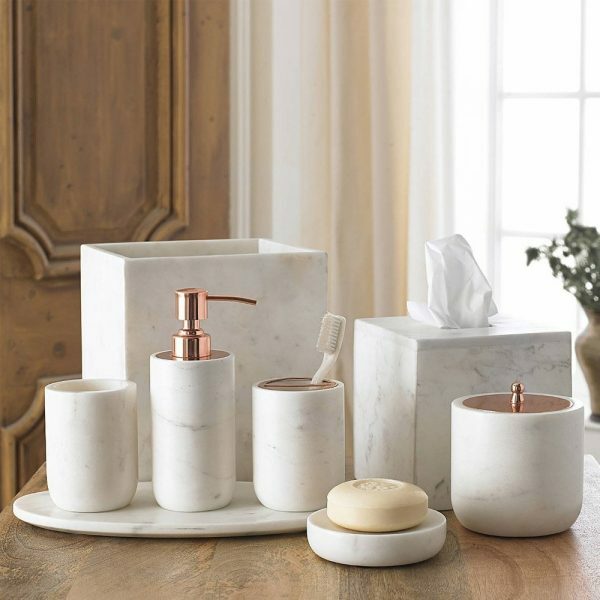 White Marble Soap Dispenser & Accessory Set: Speaking of stone, this eight-piece set stuns in hard-to-find Calcatta marble. Comprised of a rubbish bin, cup, tissue box, soap dish, toothbrush holder, soap dispenser, ledge and nifty jar, its clean and sophisticated look is sure to impress. 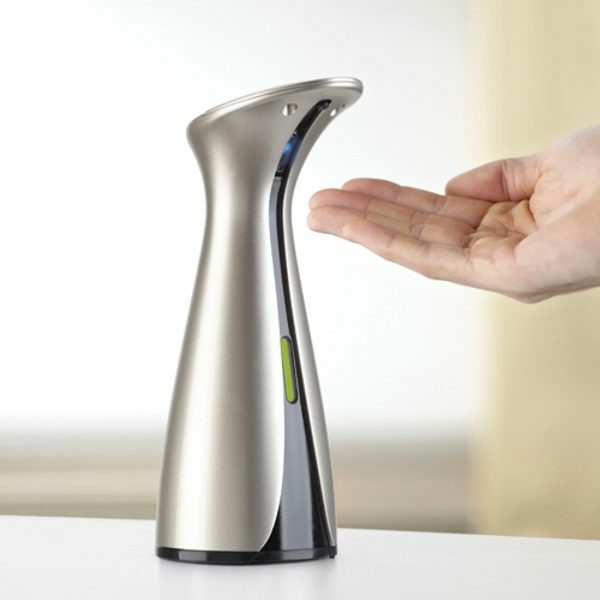 Automatic Soap Dispenser (Brushed Nickel): Ever wanted an automatic dispenser? This brushed-nickel find by Dennis Cheng is powered by AAA batteries, providing a smooth, clean release in one contemporary package. 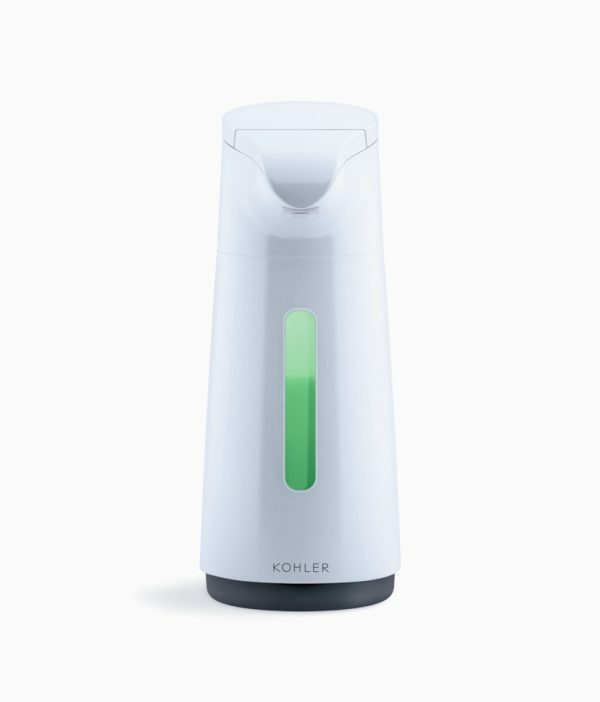 Kohler Touchless Foaming Soap Dispenser: Thinking too hard about the number of hands going through your bathroom? This piece by Kohler squirts soap or hand sanitizer as you place your hands underneath – just like in a five-star hotel. A handy soap gauge in its centre shows how long you have until your next refill. 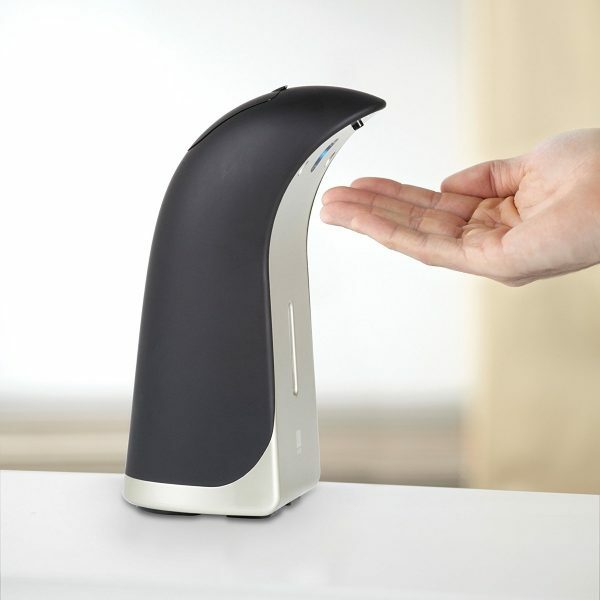 Touch-Free Foaming Soap Dispenser: For those tired of the same soap smells, this dispenser has the answer. This nifty design foams many different scents by selling its easy-click cartridges, which make it easy to refill. One automation charge lasts for three months. Automatic Electronic Soap Dispenser With Sensor: Plastic and plated nickel coalesce in this black and white design by Jordan Murphy. Electronic and powered by AAA batteries, its blue sensor light lets you know your hand is in the right place. 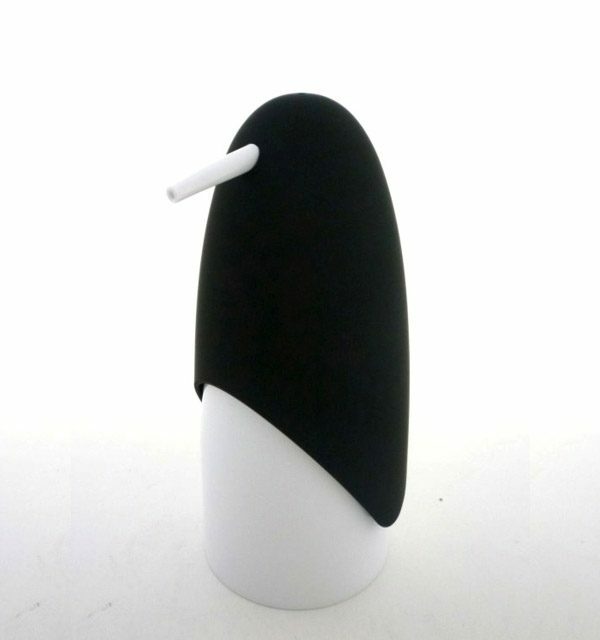 Penguin-Shaped Stylish Soap Dispenser: Guests will look twice at this plastic penguin dispenser that is almost not a penguin. 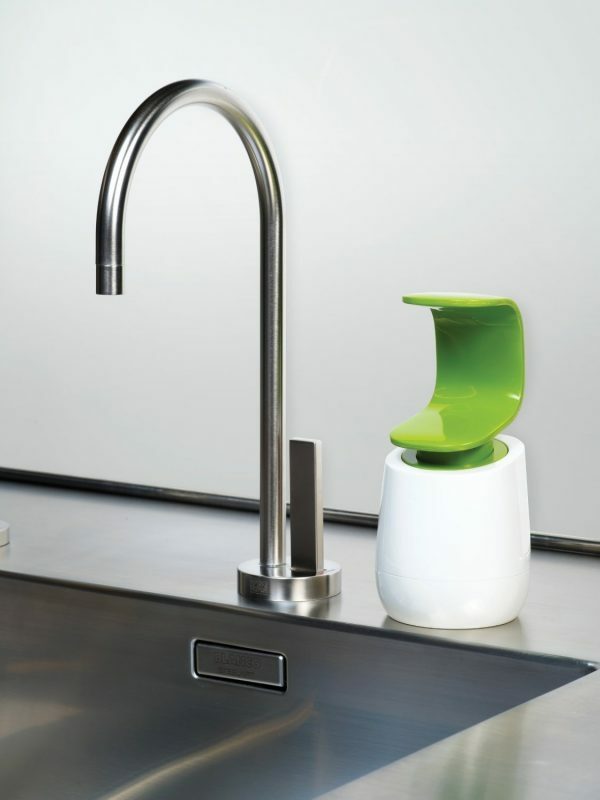 Featuring a sassy beak dispensing your hand wash, it’s an easy pairing with a range of kitchen and bathroom interiors. Modern Soap Dispenser: This innovative green and white design is pressed on the bottom of its handle, squirting from the top. Easy to use with just the one hand, it’s touted as a more hygienic way to keep your hands clean. A handy gauge at the back tells when it’s time to top up. 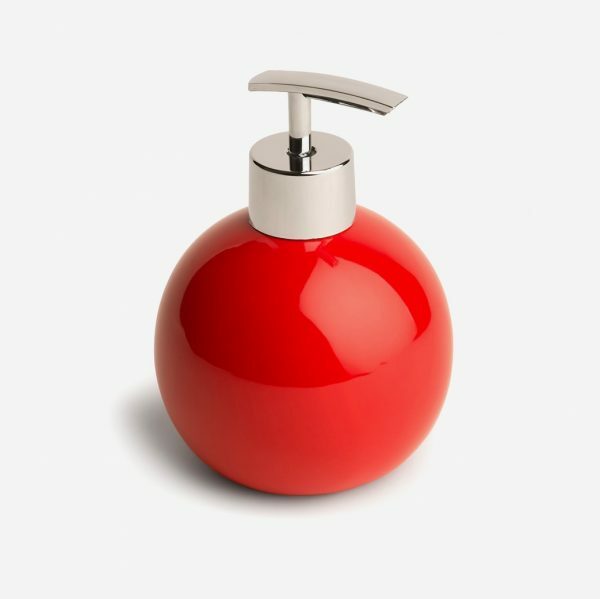 Spherical Red Ceramic Soap Dispenser: Not just for soap, this plastic chrome-finish beauty is perfect for your hand lotions, sanitisers, or any type of everyday cream. Rest its rounded body on your bedroom side table or bathroom sink for a stylish alternative to traditional pumps. 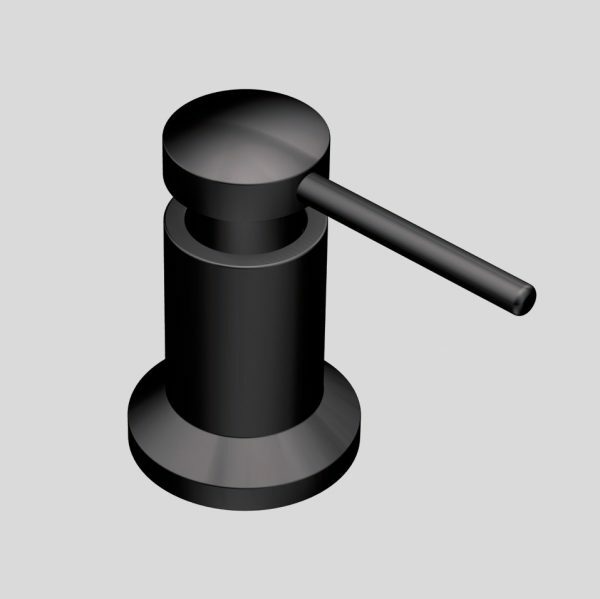 Industrial-Style Deck Mount Soap Dispenser: After a dispenser unit that attaches to your sink? This industrial home decor pump is spot-resistant, stainless and holds a lifetime warranty. 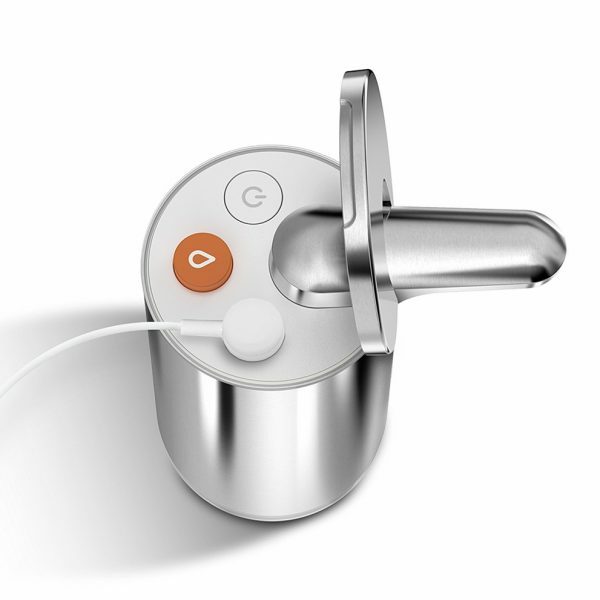 Its removable top means easy refills with a unique goose neck spout. 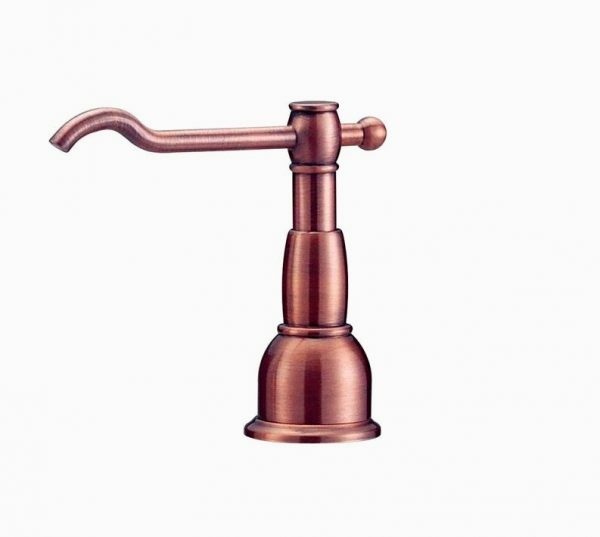 Deck-Mounted Copper Soap Dispenser: Copper steals the show in this unique-looking dispenser attached to your sink. 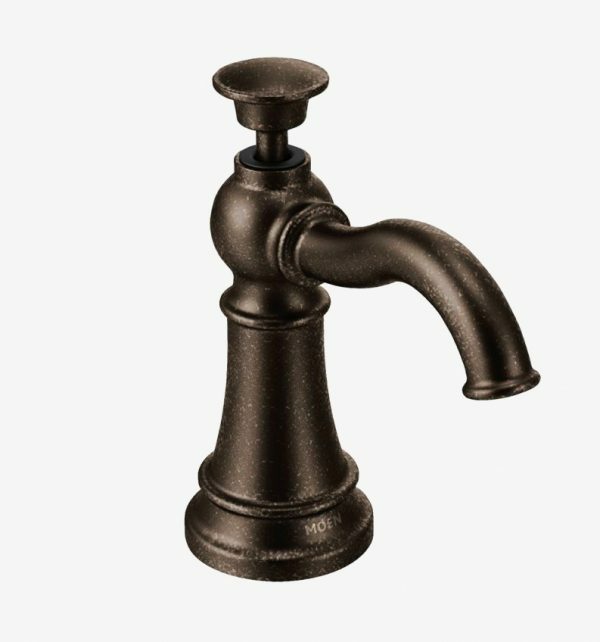 Made of brass with an antique finish, there’s a matching faucet collection for those wanting the full set. 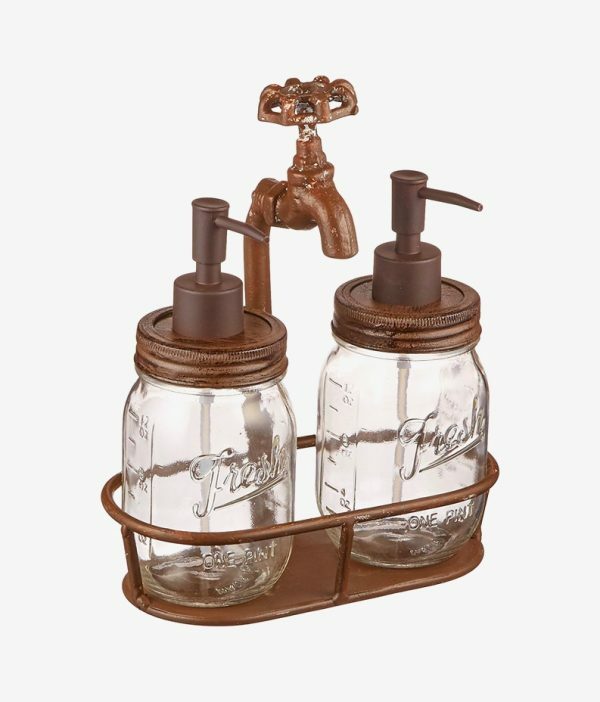 Antique Style Mason Jar Soap & Lotion Dispenser: Perfect for a gift, this glass and galvanized metal set of two bring a secret garden vibe to you or your friend’s bathroom. A rustic cast metal caddy makes it easy to present and move around the house. 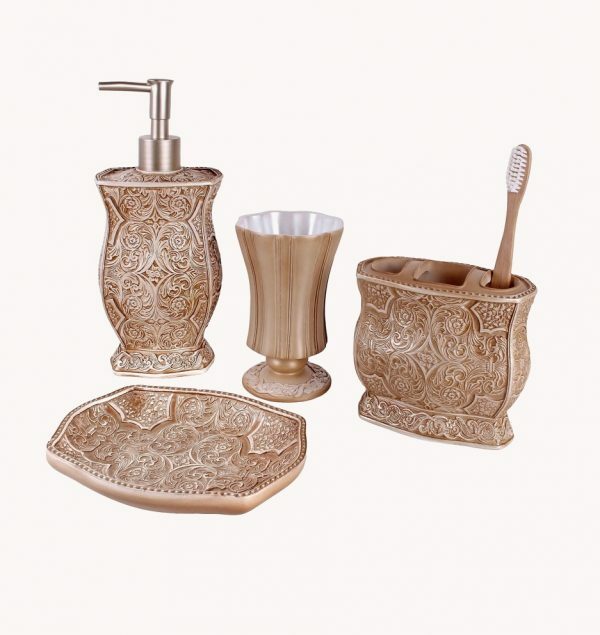 Victorian-Style Soap Dispenser & Bathroom Accessory Set: Live like a queen with a matching bathroom set in acrylic resin. 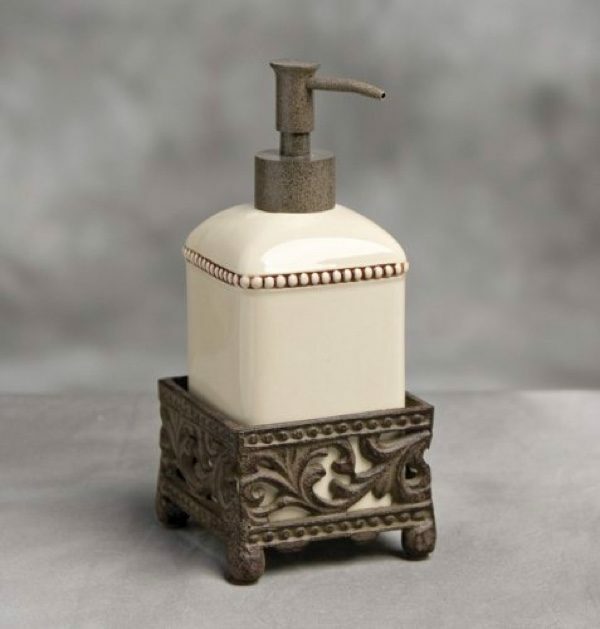 Crafted to suit a Victorian style, its soap dispenser, stemmed tumbler, soap dish and toothbrush holder’s design prevent slippage through their engraved patterning. 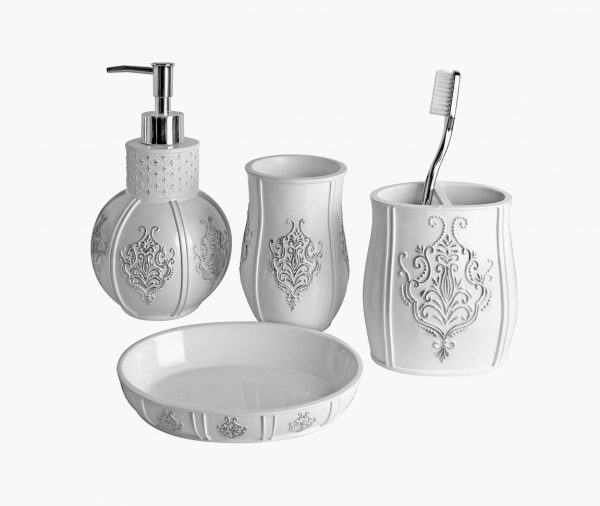 Vintage White Soap Dispenser & Accessory Set: Shock-proof and waterproof, this acrylic resin set of four adds French elegance to your bathroom with a fleur-de-lis. 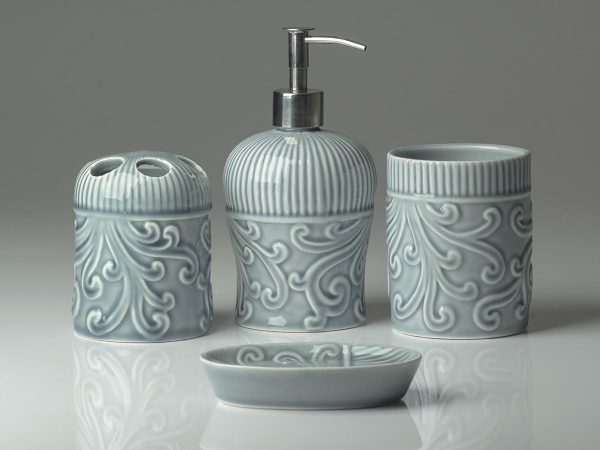 Its white soap dish, toothbrush holder, tumbler and dispenser are an easy match with white bathroom fittings. If you are interested in the fleur de lis style, do check out our post: Fleur De Lis Home Decor, where we cover everything about this symbol. 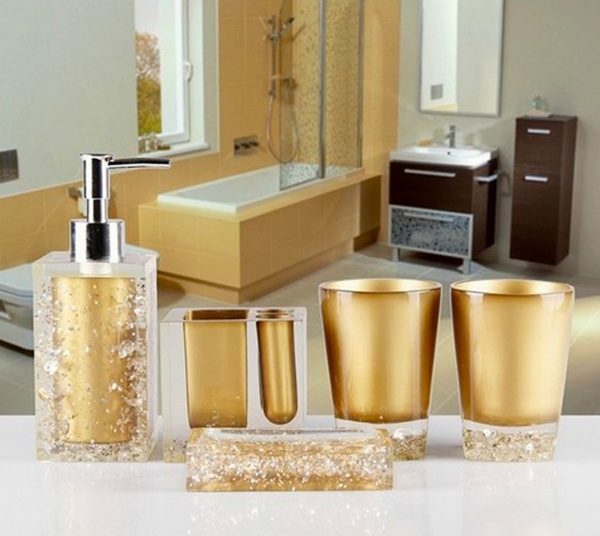 Golden Soap Dispenser Set: Available in white, black, red or purple, this golden design makes your bathroom glitter with cleanliness. Two tumblers, a dispenser, soap dish and toothbrush holder make the perfect gift for newlyweds. Wall Mount Stainless Steel Soap Dispenser: Not a fan of a cluttered sink space? This stainless steel find mounts on your kitchen or bathroom wall, for a somewhat-hidden hand-washing experience. 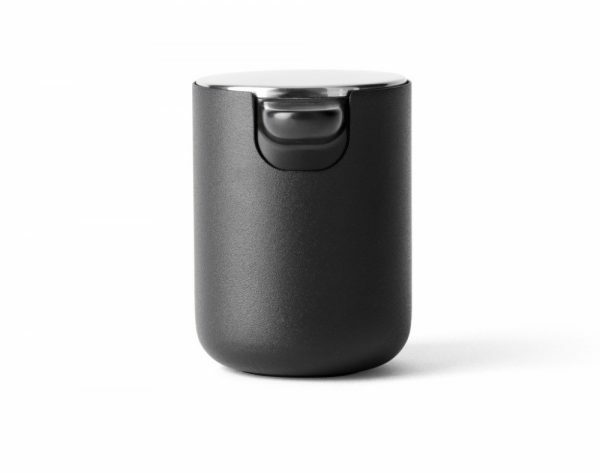 Moan Matte Black Soap Dispenser: An 18-ounce bottle sits underneath this classic black matte design. Attach it to your sink for a contemporary feel with a lifetime warranty. Kitchen Sink Soap Pump With Scrubby Holder: The dish scrubber is an awkward invention for a kitchen sink. Where does it live? How can it be made to have a home? This high-gloss ceramic dispenser comes with its own scrubby and perfect cubby at the back, helping both your hands and dishes remain clean. 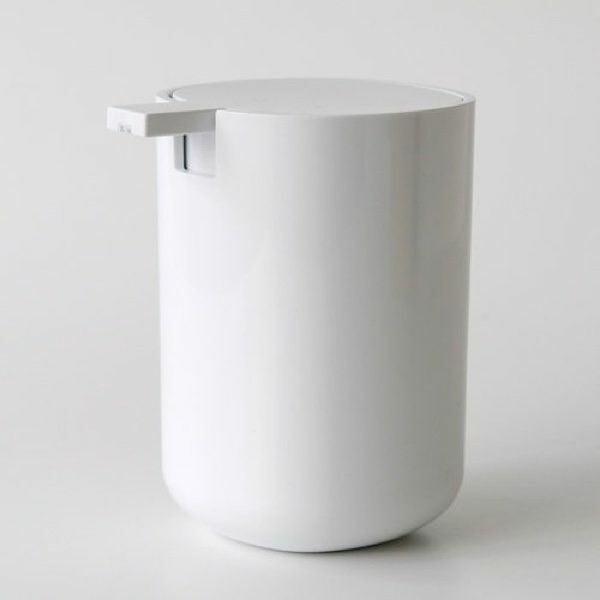 Minimalist Scandinavian Soap Dispenser: Designed by Norm Architects, this minimalist item features a rubber base avoiding slippage. Press its large top button for just the right amount of soap in your kitchen or bathroom. 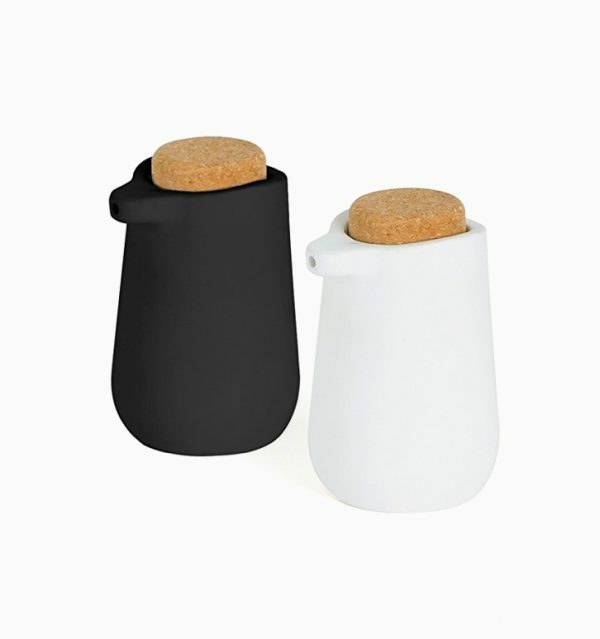 Umbra Kera Soap Dispenser: Another Umbra-led design, this cork and ceramic finish adds style to any bathroom. 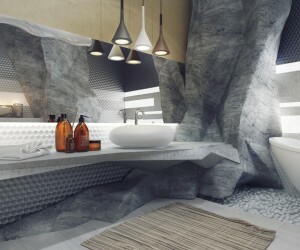 Place their black and white forms upon a minimalist bathroom sink for maximum style impact. 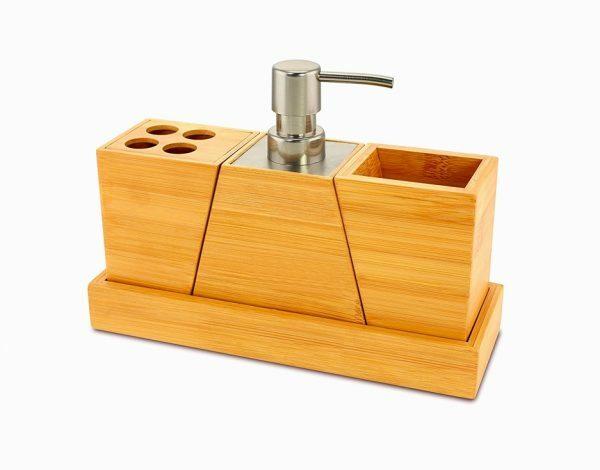 Elegant Bamboo Soap Dispenser Set: One tidy unit holds all your bathroom necessities, in this bamboo set of three. Featuring a toothbrush and toothpaste holder with a matching dispenser, its beautiful angles are hand-crafted to fit. 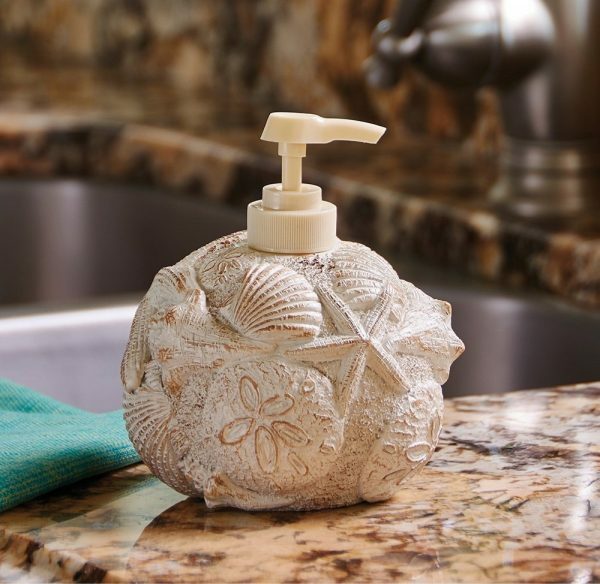 Nautical-Themed Soap Dispenser: Have a beach home missing a nautical dispenser? This ceramic find hosts seashells on the seashore – and soap within. Do check out our nautical home decor accessories post for more items fitting this theme. 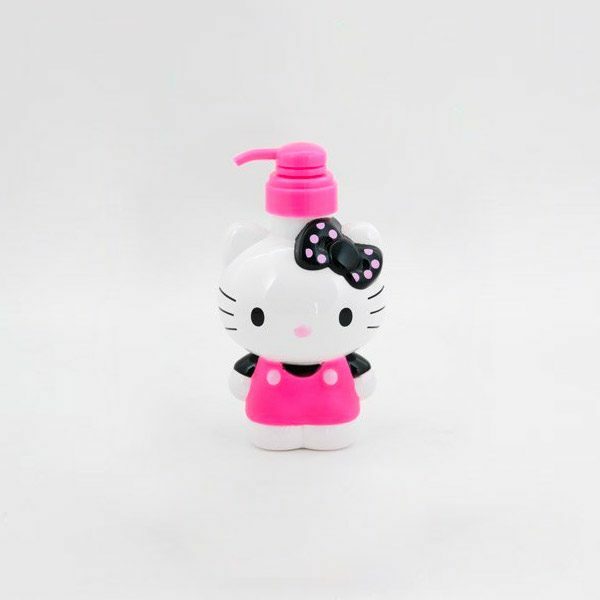 Hello Kitty Soap Dispenser: Everybody loves the famous cat that is not a cat. 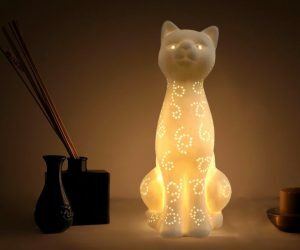 Put shampoo, conditioner or soap within this PET dispenser for more fun and happiness during bath time. 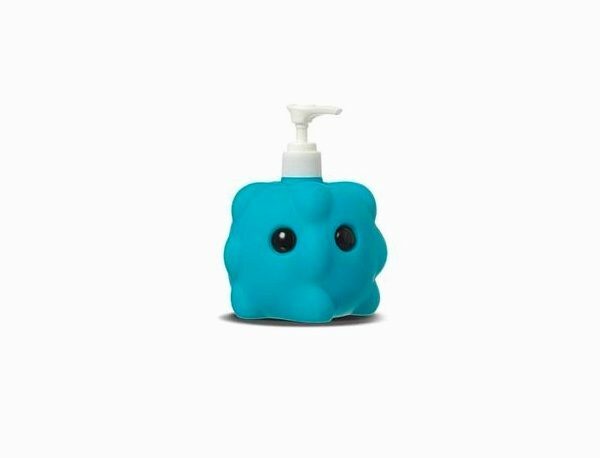 Microbe Kids Room Soap Dispenser: Teach your kids to wash their hands, with a dispenser that looks like a germ. This blue creature represents a microbe left over from eating and playing. 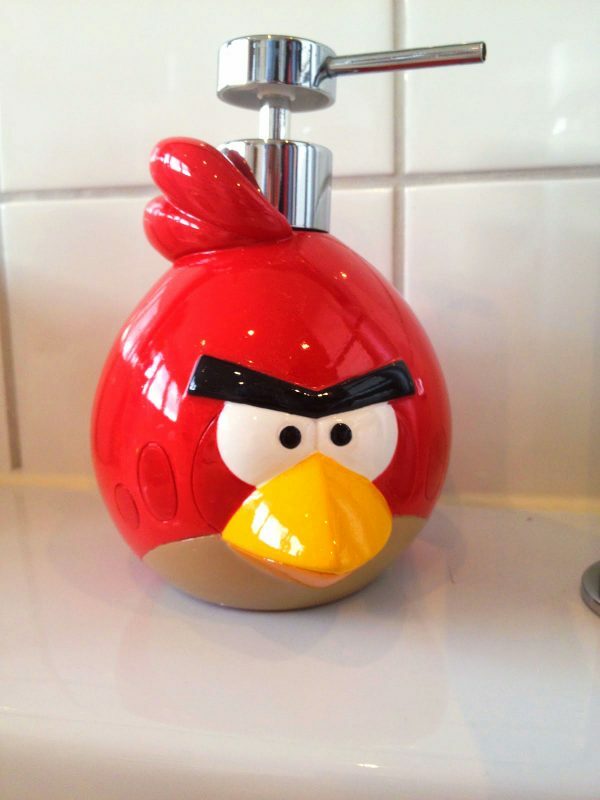 Angry Birds Soap Pump: Take the easy route at your kids’ bedtime, with an Angry Birds dispenser beside the bath. Its glossy ceramic finish makes washing hair an interactive experience. Do check out our angry birds inspired home accessories post for more. 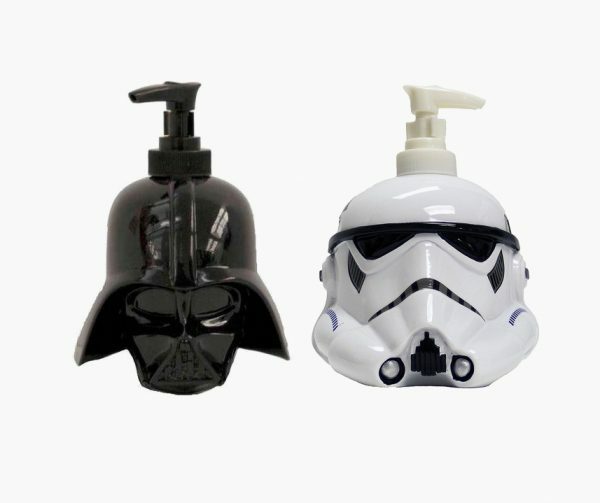 Star Wars Soap Dispenser: The Storm Trooper and Darth Vader combine to clean your teenager’s hair. These soap, shampoo or conditioner dispensers look cool and offer cleanliness. 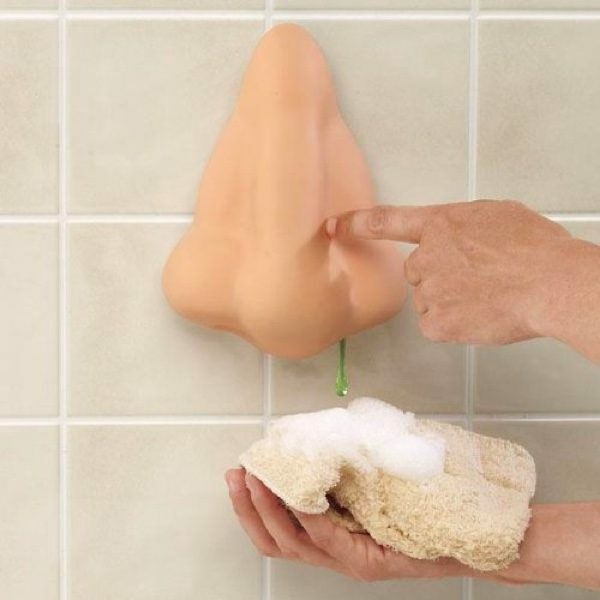 Funny Runny Nose Soap Dispenser: Need a jokey gift for a new acquaintance? This runny nose soap dispenser breaks the ice and washes the body. Owl Soap Dispenser: Give your guests a shock with this wise example of owl home décor. Its ceramic white finish blends in perfectly with classic amenities. 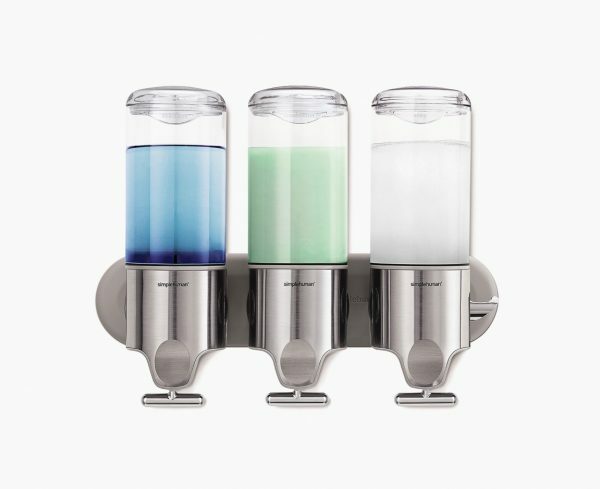 Simplehuman Shower Soap & Shampoo Dispenser: Tired of shampoo and conditioner bottles cluttering up your shower? This set of three bottles attach to your shower via adhesive or screws. Perfect for the home or office shower, they’re anti-rust and easy to refill.